There are probably not too many instances where a company began producing threshers after they had already become a presence in the combine market. Apparently, though, Deere and Company officials felt that there would be a market for threshers for a long enough period of time to amortize the expenses of beginning a new product line. It’s not exactly that it cost Deere a fortune to get into the thresher business. In October of 1929, a check for $42,500 would buy your company “grain separator patents, patterns, dies, tools, jigs and 23 complete separators.” The seller was the Wagner-Langemo Company, which had found itself in financial distress. The Minneapolis, Minnesota-based company had been producing 24 by 42 and 28 by 50 inch threshers. The all-steel machines called “Hooverizers” were said to be light draft and suited to the power output of a Fordson tractor. 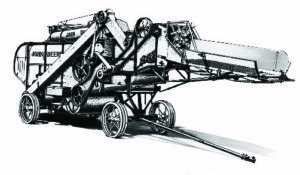 The first John Deere threshing machines were identical to the Hooverizers with the exception of the name and graphics. 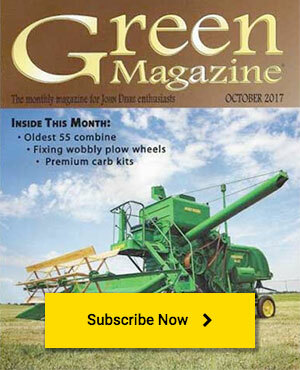 Since Deere engineers had already been at work for over 10 years developing combines, they immediately saw ways in which improvements could be made to these threshers. By April of 1931, the new Deere threshers had more bars and teeth on the cylinder, increased length and number of grates on the concave and longer straw walkers. These changes increased the capacity and cleaning ability of the threshers and, according to ads of the day, gave them “the capacity to handle the heaviest crops, the longest straw and the weediest bundles and do a speedy low cost job of threshing.” The 24 by 42 inch machine was said to be the perfect match for the “GP” tractor as was the 28 by 50 inch machine to the model “D.” A tractor hitch was standard on both models but a horse hitch was also available. Back in that day, the “Hart Self Feeder” was the Cadillac of feeders and was what the Deere threshers were equipped with. Before the invention of the feeder, one or two workers were stationed on a platform at the front of the thresher. There they took bundles, cut off the twine or wire and fed the straw into the cylinder. With the invention of the self feeder and development of twine-tying binders, this hot, dirty work was replaced by something that was still hot and dirty, but less so. Now workers threw bundles onto a conveyor chain. As it was fed into the machine, rotating or reciprocating knives cut the twine. A governor mechanism on the side of the feeder slowed or stopped the conveyor chain when the cylinder speed dropped because of overloading. Even though it might have appeared as though the days of the threshing crew were numbered, Deere wasn’t content to stand pat and in 1937, the company introduced two new improved models. They were called the “John Deere All-Steel Straw Walker Threshers.” Available in 22 by 36 inch and 28 by 46 inch, they were actually slightly smaller than previous models but could do as much or more work. There were several changes and refinements in the overall design, but the biggest improvement was in the four, long, more aggressive five step straw walkers. The official Deere story is that the company quit selling threshers in 1947. However, they still appear in the 1950 Deere dealers’ catalogs and “Better Farming” catalogs sent to customers. Excess inventory perhaps? One question often asked is—what’s the deal with the threshers painted green instead of galvanized? A good question but again, facts are unclear. Perhaps the change was made during the war years due to material shortages? While most of the Deere threshers have gone on to that great wheat field in the sky, you will still see a few at shows or on collector’s yards—reminders of a time when a company was still willing to get a late start in a field of technology that was already becoming obsolete. I doubt that you would see that today.